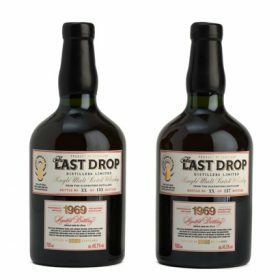 Exclusive spirits bottler The Last Drop Distillers has unveiled two single cask Glenrothes whiskies from 1969. Following the company’s launch of Glenrothes 1968 Single Malt Scotch whisky, The Last Drop Distillers is preparing to release two single cask bottlings containing spirit from casks filled on 27 October 1969. The two ex-Bourbon casks have remained undisturbed until bottling earlier this year, with the first cask yielding 130 bottles, and the second cask 141 bottles. In a statement, The Last Drop Distillers said: “We are delighted with the second of our trilogy of old Glenrothes single malts. Only a very fortunate few will have the chance to sample these exceptional spirits, which are wonderful examples of fine distilling from the 1960s. Whisky writer Charles Maclean shared his tasting notes of the two whiskies, stating that both casks display similar aromatic profiles, but cask number 16203 appeared “drier and less fruity, with snuffed candle at the base”, while cask 16207 had a “smooth texture, with a sweet and sour taste and a long, warming finish”. Bottled at 45.7% abv and 46.8% abv, the two whiskies carry a recommended retail price of £4,500 (US$5,890).